These Harvard homeowners want to make their family living space more cozy and welcoming. They have been in this home for only a short time. After more than 30 years together, the couple’s style has gone from the traditional and expected to a contemporary version of Shaker with a crisp, stylish edge. There is simplicity here, but with a stroke of the unexpected. The family is welcoming and casual, yet with traditional values. It shows in their home and its furnishings. The freshly painted white walls were a great way for the family to begin life in this house, but now it’s time to add something of themselves. They do a lot of entertaining, so an open, flowing floor plan is important. At night, the family gathers in the dining room and study. They choose to use what was intended to be the family room as their dining room and family gathering spot. 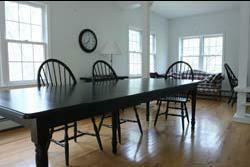 An extended space is needed for the dining room table that opens up to seat 20. The north end of this room has an area that is being used as a study. It has a desk with a computer, an antique chair, and a brightly colored camelback sofa. The family uses the dining–study space as their place to wind down each day, as well as their place to come together as a family. This area is the heart of the home. On the southern end of the dining room is a fireplace. Chairs are placed in front of the fireplace for cozy seating in front of a winter’s warming fire. These chairs can also be used at the dining table when the crowd around the table requires it. The family needs book storage as well, and they want to add a wall of bookshelves. I suggested that the bookshelves be built where the columns and shelves divide the extended room. Library shelves can be built on the study side. The shelving will go from floor to ceiling on either side of the doorway as well as the space above the doorframe. The space will be further divided by French doors, which can be closed off for privacy while working or reading. They can also be opened when there are large gatherings, and extra seating space is needed. Many wonderful objects are waiting to be unpacked once there is a place for them to be displayed: on the dining room side of the bookshelves, we drew up a plan to build shelves to house the treasures that this couple has accumulated in their travels. It will be a tribute to their lives together. What will pull this room together is a color treatment on the walls. Faux painting on the walls will allow a neutral, yet vibrant, background to warm the room and connect it to the other living spaces. A treatment called ragging will allow several shades of color to be used in varying degrees of intensity. The main color scheme in the house is black and tan with a splash of red. A version of warm tan on the walls would be a neutral backdrop to bring the room together and allow the furnishings, art, and accessories to stand out. Shadowbox moulding on the lower half of the room will also connect the raised panel woodwork on the fireplace surround with the dining room. An antique white on the mouldings will soften the brown on the walls. 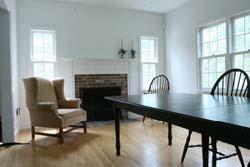 I look forward to seeing the changes in this room transform a nontraditional Cape into an inviting retreat. Anne Hentz of Ann Lee Road is the Designing Diva at annehentzinteriors.com. Readers with a decorating dilemma can email a description of their home to features@harvardpress.com for future consideration..